SONOSIM SUMMARY: This article touches on several of the procedural applications of bedside ultrasound, and how bedside ultrasound improves patient care through error reduction. Ultrasound-guided central venous catheter placement is noted to be among the highest rated patient safety practices, as it allows the physician to precisely locate vessels and surrounding structures, and confirm that the needle and guide-wire are in the lumen of the vein. Ultrasound is also useful for performing thoracenteses, as the physician may actually visualize the pleural effusion and surrounding anatomical structures, thus reducing the frequency of iatrogenic pneumothoraces. 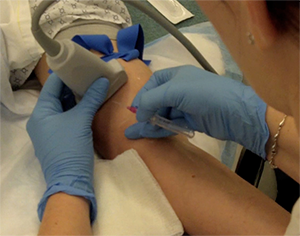 Soft-tissue ultrasound is discussed for assessing cellulitis versus abscess, as ultrasound has been shown to change clinical management in about half of those cases. Lastly, ultrasound allows emergency physicians and anesthesiologists to directly target nerve sheaths for extremity nerve blocks. Even given all of the established benefits of ultrasound, 66% of community EDs still do not have access to ultrasonography for ED physician use (at the time of this publication); this statistic is quickly changing, as more and more residency program directors choose to integrate ultrasound education into their curricula. To read the complete article, visit The Annals of Emergency Medicine website by clicking here.